Easy sign making for schools. 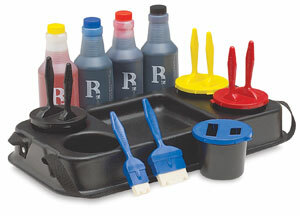 Sign caddy holds 4 containers for water-base, non-toxic Chromark ink in 4 colors (pints) and wide felt brushes (color-coded). One side of felt is notched to create multi-line effects.